Last month, Michael and I were so blessed to have the opportunity to have a quick lunch with Joni Eareckson Tada and Ken Tada. They were in town because Joni was the honorary chairwoman for the National Day of Prayer. I can't even tell you the impact this couple has had on our lives. Last year, when I was just completely lost in the sea of trying to find myself in this marriage that was feeling awfully crowded with the two of us, Michael's disability and my anxiety and depression, I reached out to their organization, Joni and Friends. They sent me a bunch of books that Joni has written about how God has used her disability (she's a quadriplegic too, from a diving accident more than 40 years ago) to reach others, and to sharpen her spiritually. More than anything, an episode of her TV program about disability and marriage, with Mike and Renee Bondi, really impacted me. I watched those two couples talk, hug, and the part where Mike is getting Renee into bed, and I just cried and cried. I could relate! And, in our situation, there just aren't that many people to relate to. Especially young people. Thankfully, because of the internet, we have connected to a few other couples who have a wheelchair and all the stuff that goes along with it in their relationship. More on that some other time. But, back to Joni and Ken. I've been able to stay in touch with their office, and this short lunch was so cool! We went to Cosi, had soup and salad and their amazing bread and leaned in and listened as Joni and Ken shared with us some wisdom from the 29 or so years they've been doing this. Their main point was the ONE thing I didn't want to hear. Get help. I don't like that. You know my aversion to help, people! More than anything, I just don't want nurse/home health provider types who wear scrubs in my house. It creeps me out. And makes me sad. But, we are doing that when I go on trips now, or when something unexpected happens and M needs help on the fly. And, I'm growing to be okay with that. So, I'm working on it. That's a good start, I think. They gave us some contact information for some other local(ish) quads we can connect with. I look forward to doing that soon, when life settles down a bit. The other thing that they told us that stuck with me was this. Michael asked her, "Don't you ever get tired of being such a stinkin' inspiration?" And Joni explained to us that she doesn't think of it like that. But she aims to be a good steward of the platform God has given her. When my ears heard that, I knew that was what we were there to hear. I definitely need to remember that while there are some awfully hard days and hours and situations that come along with this stuff, it is an opportunity to have a unique impact for Christ. An impact on others. And an opportunity to experience God ourselves. 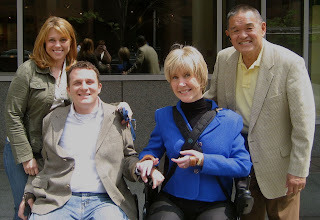 Here's that episode of Joni's TV show about disability and marriage. I think anyone who is juggling this life that we do should watch it. I should probably watch it again. And, there are some good principles about service and working together that any marriage can use. I'm hoping that this is only the beginning of our relationship with Joni and Ken. I so look up to them, and have so much to learn. They are in my prayers every day as they face all of this, leading an international ministry, and Joni fights Breast Cancer. Wow. God bless you both. God provides help in the spiritual and in the physical. Let his helpers give you a hand with every need. Love you. Wow. Loved that video--that's good stuff right there, for all of us. I'm excited to see what God has in store for you guys. I'm sure it's something very good. You are both special individuals, and a dynamic couple...and I've never even met you, Dana! :) God's blessings to you. her books have really minsterred to me too. what a neat opportunity. I truly love her and am thankful she is using her platform and tell mike i am thankful for him and his inspiration too. lol.